This is from Ottolenghi, and has become one of my favorite recipes. A bit fussy, since it takes 4 pots to make, but worth the effort. Heat the olive oil in a saucepan, add the garlic and fry until golden, 2 minutes. Add the tomatoes, water, vinegar, salt, and cumin, bring to a boil, then lower the heat and simmer, stirring occasionaly, until slightly thickened, 20 minutes or so. Remove from heat and stir in the cilantro. Keep warm. While the tomato sauce is cooking, rinse the lentils, then cover them with plenty of cold water, bring to a boil. Reduce the heat and simmer for 25 minutes. The lentils should be tender but not mushy. Drain in a colander and set aside. Wash the rice and set it aside to drain. Heat the olive oil in a large saucepan over medium heat. Add the rice vermicelli and stir. Continue frying until the vermicelli browns a bit. Add the drained rice and mix well until it is coated in the oil. Add the water, cinnamon, nutmeg, salt, and pepper. Bring to a boil, cover, reduce the head to a minimum and simmer for 12 minutes. Turn off the heat, remove the lid, cover the pan with a clean kitchen towel, and put the lid back on. Leave like that for 5 minutes. This helps make the rice fluffy. While the rice is cooking, heat the remaining oil in a frying pan. Add the onions and saute over medium heat for about 20 minutes, stirring often, until well caramelized. To serve, fold the lentils and most of the onions into the rice (reserve a few onions for garnish). 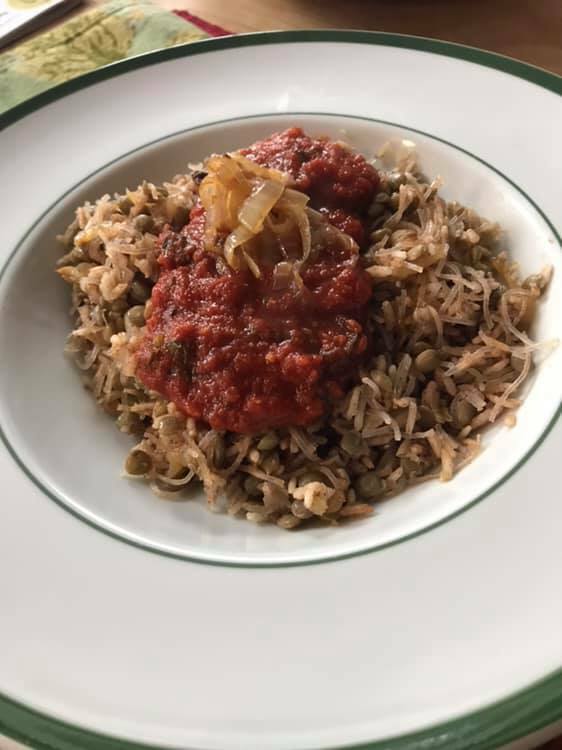 Serve the rice and lentils in shallow bowls, topped with the tomato sauce and garnished with the onion. In main course, Savory, Vegetarian. Bookmark the permalink.